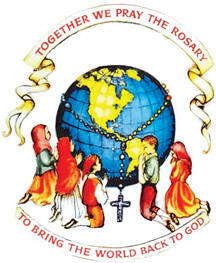 The Living Rosary Association was founded by Ven. Pauline-Marie Jaricot in 1826 at Lyons, France, at the age of 27. She first founded The Propagation of the Faith, at the age of 20. Pauline was a close friend of St. Jean-Marie Vianney, the Curé of Ars. The Association of the Living Rosary was formally approved and richly indulgenced by Pope Gregory XVI, and accorded official canonical status on January 27. 1832. The purpose of the Living Rosary is to appease the wrath of God through the intercession of Our Lady of the Holy Rosary in order to preserve and revive the faith in the souls of the faithful, and to obtain the conversion of sinners and the exaltation of Holy Mother the Church. The Living Rosary is not a new devotion, but a continuation of the Rosary preached by St. Dominic and announced by Our Blessed Mother for centuries. In these days of evil, confusion and chaos, division and modernism, the Living Rosary will be a mighty force in every family, parish, diocese and country. The Holy Rosary is a gift of the Queen of Heaven. If prayed faithfully and strengthened by the unity of association, it will render all the attacks of Satan impotent. The Living Rosary is endowed with great power before the throne of God through the union of charity which flows through its members. Immense are the graces and merits obtained by each and every member, daily, when united and animated by the Fire of Divine Love in the Immaculate Heart of Mary. One who prays the Rosary alone receives the grace and merits of one Rosary, but if he/she is united with TWELVE million members, he/she gains the graces and merits of the whole. PRINT CLEARLY your name and full mailing address, and post this information to us. You may enroll family members and friends but always secure their permission before sending us their name for membership. Members in the USA, Canada and England are enrolled individually and will receive a regular mailing of the beautiful newsletter, the Dedicated Decades, at no cost. All other members are enrolled in groups of 15, and their Promoter coordinates the mailings and helps to supply materials, Sacramentals and newsletters, as is made possible by the donations of those who are able to contribute for the growth and support of this Apostolate. The entire work is made possible through the voluntary donations of our members, and by the fruit of the prayers of those who are not able to donate financially. Your personal address and records are held here at the Center, and never released to any individual or organization without your explicit written per-mission. Should you decide, at any time, that you wish to terminate your membership, or you have a change of address, please write and let us know. Your assigned Mystery is a perpetual and personal commitment and cannot be carried by or terminated by another. In the event of death, please arrange for a relative or friend to notify us of your demise. We will see that your Decade is reassigned and the Holy Mass offered for your departed soul. Any time of the day or night and in any place. There is no necessity to gather in a group. A voluntary donation of $1.00, sent each month to the Center, will help us with the expenses we incur when providing Sacramentals for our foreign missionaries since more than three-fourth of our membership lies in Third World Countries. Your Dollar will also help to defray the operational expenses of the Association. All donations are gratefully received but, if you are financially unable to donate, please pray for the relief of our material needs. Pray for our members, living and deceased. Our devotion, commitment and success depend upon our fidelity to the rules and faithfulness to the prayers. The Petit Manual of the Living Rosary Association may be obtained from the Universal Center in Dickinson, Texas. The mission, heart and center of the Living Rosary is FATIMA. Let us fulfill the requests made by Our Lady of the Most Holy Rosary: (1) cease offending God Who is already too much offended, (2) pray the Rosary every day, (3) make fervently your Morning Offering, (4) wear the Brown Scapular as a sign of your consecration to the Immaculate Heart of Mary, and offer the penance of (5) DAILY DUTY in reparation to the Sacred Hearts of Jesus and Mary! We show the greatest love for Our Immaculate Mother when we share our love for her with others. Mary is our Mother, the Mediatrix of all Grace and Co-Redemptrix with Jesus Christ in our redemption. Her part in our salvation was essential and our devotion to her is essential if we are to fulfill God’s Holy Will during out earthly sojourn. What a privilege! What a joy! What a blessing to dwell in Mary! WE MUST defend her rights, fight for her glory and attract the whole world to her service … for this is the Will of God! The Living Rosary is a canonically instituted Society. The privileges and indulgences obtained by the members are much too numerous to be listed here, but may be obtained by request from our Center. In the first three centuries of the Church, the blood of Martyrs was the seed of the rapid extension of Christendom. This shedding of the blood of Martyrs increased the strength of the Church rather than crushing it. We face an entirely different situation today! Persecution is coming to us from those who once embraced the Catholic Faith and who were a part of the Mystical Body of Christ. These apostates and heretics, now, make war against the Spirit of Truth from within the bosom of the Church. Persecution from ignorant pagans who never possessed the Truth, is totally different than the suffering we undergo, today, from those who once embraced Truth and were temples of the Holy Ghost. Their hate knows no bounds, their pride is unequaled and their method of operation is impurity, lies and deceit. God has set enmities between them and us; the Immaculate Conception has crushed the head of these revolting angels. Our victory lies in our surrender, total and complete, to Jesus Christ through the Immaculate Heart of Mary! The paper you hold is for your information and guidance towards promotion of the Living Rosary Association in your family, parish, diocese and country. Kindly make copies of it and circulate it to all who will receive this gift which issues forth to the world through the love in your heart, that souls may be saved and Holy Mother the Church may triumph over the colossal evil of our day. This entry was posted on Wednesday, February 8th, 2012 at 11:53 pm and is filed under NewsFlash, Saint Philomena. You can follow any responses to this entry through the RSS 2.0 feed. Both comments and pings are currently closed.